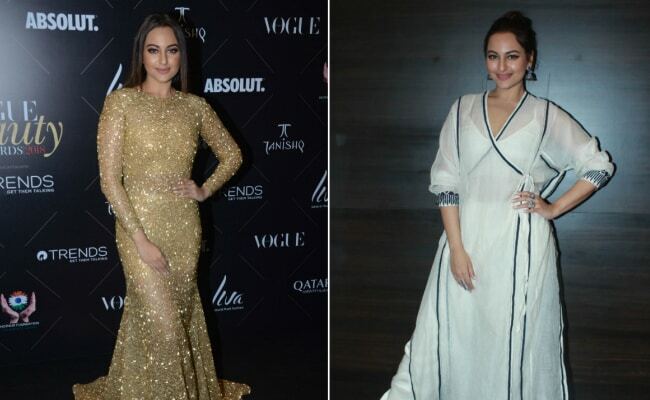 Bollywood actress Sonakshi Sinha has been having a stylish week indeed. The star, who is known for her inspiring fitness journey, has not only been impressing all by nailing challenging workouts and pilates, but also with her chic fashion choices. From glamming up in sparkly designer gowns and embellished sarees to looking sensational in bodycon dresses (remember the sleek black latex dress that she wore for Karan Johar’s singles only Valentine’s Day party? ), her style game seems to be getting better and better. We recently spotted Sonakshi at Vogue Beauty Awards, stepping it up in a glamorous gown by Ali Younes and looking every bit like a diva. The heavily embellished gold outfit had a body hugging structure that flattered Sonakshi’s well-toned body, and added the right amount of spark to her look. Sonakshi let her dress do all the talking and went for a zero accessories look while keeping her hair and makeup minimalist too. On the work front, Sonakshi is currently busy with the promotions of her upcoming film Happy Phirr Bhag Jayegi. For a recent event, we spotted her sprucing up her ethnic style game by wearing a quirky kurta from Ikai by Ragini Ahuja. Ethnic dressing has probably never got as much love as it has this season, and Sonakshi gets it on point. The sheer organza kurta in white seemed like a perfect way to beat the heat, while the sleek piping detail in black gave it an interesting edge. Sonakshi teamed it with a pair of white palazzos. To perfect her look, the actress sported a bun hairdo, silver jhumkas, statement rings and cat eye makeup. Keeping with the theme of the film, Sonakshi switched her sandals with a pair of white sneakers to strike a pose. Here’s hoping to see more of Sonakshi Sinha and how she keeps up with her chic style statements.